I was half way through residency. Pre 80 hour work week regulations, 2001. Here is what my schedule looked like: Monday morning, arrive at hospital to round by 5. Leave hospital Tuesday evening around 6. Work out. Eat a bagel and cream cheese and some carrots for dinner. Prepare for presentation on esoteric knee fractures while falling asleep. Repeat. An easy week was 90 hours. Most were 100 or more. And my body had the audacity to fail me. Fever, chills, vomiting. I did the unthinkable. I called in sick. I paged my attending. The actual words I heard, “I’ve never heard of a resident calling in sick. Are you sure?” I was sure. In fact, I had barfed again while waiting for the page to be returned. Times I had slogged through work sick… pink eye, scabies picked up in the call room, I even passed a kidney stone on call, Not once, but twice, I had a nurse give me a bag of IV fluid mid stomach flu so that I could get through the surgery day. It was not uncommon to quietly step away from the operating room table to quickly vomit, then scrub back into surgery. Of course this was always accompanied by the question all women residents are used to, “Are you pregnant?” I was not. Just sick. On this day that I was sure I was too sick to work, my nausea was exacerbated by my shame. I had done the taboo. I admitted weakness. There was no system to backfill or cover for sickness. Because it never happened. My attending would have to round and see the patients with the medical student. My work would be done by my superior. I was terrified of the implications. I truly thought I might get fired. I am still ashamed, 17 years later, when I see this surgeon. I actually am afraid that I am still in trouble. When I practiced at an academic hospital from 2004-2011, it was still rare for residents to stay home sick and rarer for attending surgeons to miss work for sickness. I came to work with fevers, runny nose, flu. I operated the day before I gave birth. Of these things I am actually no longer proud. We understand that impaired doctors should not take care of patients. We understand that doctors cannot be intoxicated. No drugs. No alcohol. Yet even in 2018, doctors work through sleep deprivation and illness. So many reasons, some good and some awful. Pride. Finances. Patient expectations. Administrative expectations. Nursing expectations. So this year, when I got shingles at the age of 46, I struggled with all of this. The pain was unreal. But this is not what kept me home for 4 days. Actually, I have 2 surgeon friends who took no time off for shingles this year. What kept me home was the fact that my rash was on my neck and I could not hide it. And I was contagious. I take care of young people, babies, and sometimes even older people who do not have the best immune systems. The guilt was huge. I am a trumpeter of physician wellness, staying fit and staying sane, doctors are people too… yet to stay away from work as a sick doctor remains foreign and shameful even to me. We must work to change this culture. To promote wellness. To be brave enough not to go to work when we are sick. When our culture of medicine can respect our roles as nurturers who must be nourished themselves, we will have coverage for ourselves. After 45 years as a practicing physician I can see us inching toward that reality but probably not in my or your career. As you noted when we changed the work rules for residents we did not include the attendings. What an eloquent way to phrase this. I agree wholeheartedly! As a second year resident I got yelled at for taking a day off to take care of my sick child . That was the only one day I took sick leave in 3 years of residency . The Attending even said I should not have had a child before finishing residency and the other residents agreed with the attending . As a full fledged Physician now ,I have to beg admin to get a day off for Doctor/Dentist appt . I am so sad to see this. One of my dearest friends, also a woman surgeon, argues that women should wait until after residency to have children. I love her and respect her, but cringe when she makes this argument in public. Until pregnancy is supported in residency by women and men, women will never be on equal footing to our male partners and colleagues. Thank you very much for bringing up the issue. I was lucky that I was able to control my viral enteritis with Imodium while making round among 6 hospitals 5 years ago as solo practitioner. With that experience and the fear of more health issues arise as I am aging, I joined a physician organization. Recently I realize there is no time for sick leave. I always encourage nurses to stay home while they are sick. I am not sure I am able to follow my own advice. I am grateful that physician organizations exist to band together. And I am grateful that solo practice is alive and well for you. I just wish we lived in a world that allowed you to take care of yourself when sick. I got my second shingles vaccine this weekend. Felt horrible the next day with chills, fever and aches all over. Was so glad it was a Sunday so I did not have to miss work. That “work culture” flows through my veins. Yes, after 35 years of being an ophthalmology doc I can count my “sick days” on no more than one hand. We are not suppose to get sick. We are “superhuman”. Thank you so much for sharing your story. Only other doctors can truly appreciate and understand your dedication. But we too are human. Society needs to change the expectations it has placed on us. We need to start the revolution. 1. I have recently learned to properly spell ophthalmology. 2. if you have been doing this for 35 years I am sure you have amazing stories and insights about being a woman surgeon. 3. I am incredibly recharged by the virtual community of doctors supporting my view. I was braced for criticism, and am so relieved that in 2018 doctors seem ready to hear this. Thank you for your support. We can make a change together?! Having been a primary care provider for 34 years and a child of a mother who never believed you “are really that sick”, I have worked through sickness for years. Gone to work sick, had to be there, no one else to take my place yada yada. Well guess what? Your patients don’t want your disease, if you are infectious, you need to stay home. Worse yet, if you don’t take care of yourself, you may not be there for your patients at all, let alone your family. Ignoring my last illness nearly did me in. It put me in the hospital on a transplant list. When my doctors told me to take 8 weeks off, for good reason, to fully recover I made a decision that I would not fight them. I had almost thrown away everything I had worked for, my family, my practice, my retirement, my life. All because I couldn’t/ wouldn’t take a sick day. While my work place has been supportive, I won’t deny that there is always a feeling of “are you better yet”. But at this point I know that a lot of that is me (and my mother) saying “you really aren’t that sick”. Guess what, this time I really was. Don’t expect the system to take the guilt out of it. Forget about finding old MD’s of either gender who will say it is ok, you have to take care of yourself, know your limits and ignore that little voice in your head that says “you really aren’t that sick”. Because one day, it could kill you. You have to advocate for yourself, if you are a good at what you do people will wait for you, if they don’t they weren’t worth having as patients to begin with. It is a hard lesson to learn. 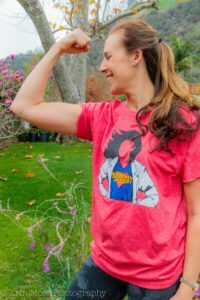 Doctor moms need capes sometimes, right?!! we are so lucky to have a system that acknowledges sick days for doctors at Kaiser Permanente!